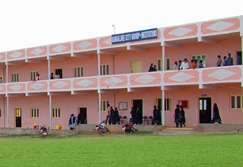 Roohi College of Nursing & College of Management was founded in the year 1992 by Deccan Education Society. First of all the Deccan Education Society Opened a School of nursing in Bidhar Dis. Karnataka State, After Some time its Converted in college of nursing, Then we opened our new and well sateled Branch in Bangalore. we are having 15 Years Experience in Nursing Education. This Society provide a batter education on lowest fees. We are also in the process of establishing other Para-medical/medical courses i.e. Pharmacy/physiotherapy/Ayurvedic etc. affiliated to Rajiv Gandhi University of Health Sciences & Bangalore University, Bangalore. We look at education differently. For us, education does not lie in the quantification of knowledge, but it lies in the quality of knowledge. Quality education doesn't mean good academic results but also the spiritual, mental and physical developing the student that helps to form the character of students. Forming them as competent, committed and compassionate human being for the society. We believe in this philosophy. This is what has made Roohi College & School of Nursing Bangalore climb to the top of the Colleges in India .We believe in training professional nurses from all states of India to meet the great challenges of service in the field of nursing. Professional nursing is a life long service to the people, and nursing must advance along with other health professional if society is to be assured of a comprehensive health care program. Therefore this institute prepares its students to develop ability to analyses situations and problems, critically and take responsibilities for their higher education for maximum professional effectiveness throughout their career. Further more this Institute believes in a system of nursing education that fits with the changing educational patterns globally to meet the needs of today's modern society. The achievement of the Country in preventing diseases and promoting health depends upon the contribution of all members of the health team, particularly that of Nurses. Life cannot be saved merely by Medicines and Surgery. Nursing is equally important to save life and relieve suffering. Nursing is also an art and science. Nurses should be capable of serving the sick with compassion and caring hand. There are wide ranges of opportunities. Globally for nurses in the field of health and for advanced studies to develop expertise in practice, administration and teaching.